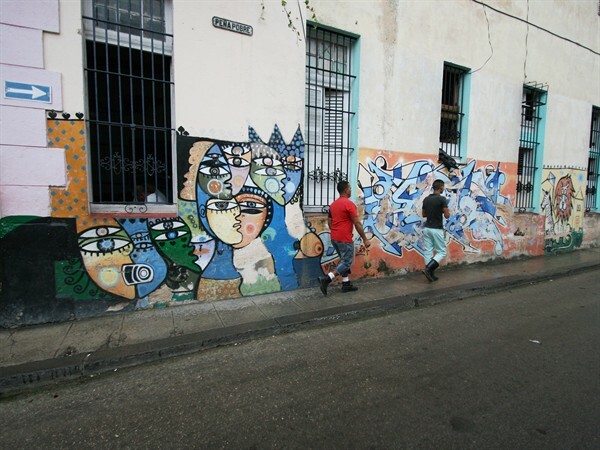 CapRadio took 65 listeners to Cuba through a U.S. sanctioned “people-to-people” tour. Pauline Bartolone hosted one of the trips, largely leaving her reporter’s hat at home. Here she shares her experiences, with a focus on health care. It’s hard to compare the Cuba of today with the Cuba I visited in 2002. That’s partly because the two styles of travel were so different. Twelve years ago, I stayed with a Cuban family for a week in a casa particular, a private home. I wandered the streets of Havana, hardly setting foot in the tourist areas. My schedule was dictated by random people and places that engaged me along the way. 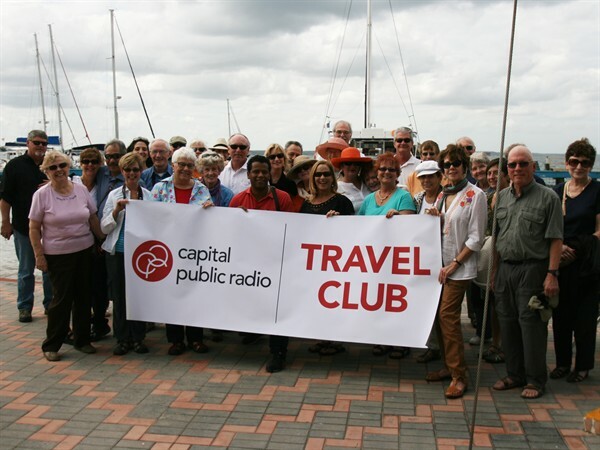 This January, I traveled with 37 people affiliated with Capital Public Radio. The “people-to-people” travel license involved a highly itemized and pre-planned daily schedule. We enjoyed a modern tour bus and were attended to every step of the way by two state-salaried Cuban tour guides. We visited museums, saw dance and music performances, hiked with hummingbirds in a national forest and ate in all the best private restaurants. Despite the travel styles that distinguished the two trips, I noticed unquestionable differences between the Cuba of then and now. Modern buses seem to have replaced the behemoth Soviet-style trucks used for public transportation that I rode back in 2002. At that time, the lack of storefronts and shortages made food unreliable, and I resorted to the bolsa negra or the informal economy to eat. Now, businesses are bustling more than ever in Old Havana, and the government has handed out thousands of licenses to operate private businesses. Today, there is a modest selection of half a dozen TV channels. Twelve years ago, there were only two. Our days in Cuba were packed. The idea was to introduce us to the culture of Cuba, through music, art and important sites in the county’s revolutionary history. Music was everywhere we went — we were lucky enough to have live six-piece bands entertain us almost every day, from Old Havana to Sancti Spiritus. One day we saw a dance and music performance by a family of Santeria practitioners in Havana. Santeria is a religion that blends cultural elements of West Africa, the Caribbean and Roman Catholicism. The belief system, based on Yoruba traditions, was brought to Cuba by enslaved West Africans. It is based on the relationship between humans and spirits and practiced through rituals and ceremonies that include dancing, music and drumming. We compiled this multimedia map of some of the trip’s highlights, so you can explore for yourself. Roll over the map to see videos, photos and audio to listen to the sights and sounds of Cuba. I did “wander” on my latest trip too. We didn’t have any planned visits to health care facilities, but I couldn’t resist exploring centers associated with Cuba’s famous health care system. My main interest was Cuba’s emphasis on prevention as opposed to treatment of disease. I had read about the country’s abundance of primary care doctors, and unique managed care model. Cuba has three categories of health care facilities. There’s the primary care clinic (consultorio), situated in every micro-neighborhood. Specialty care happens at the policlinicos. Then there are the hospitals. The consultorio I visited was austere — only a couple of exam rooms off the waiting room, and no front desk. One waiting room poster explained medicinal plants and another offered tips for preventing accidents and illness. The doctor wouldn’t talk to me because I didn’t have a journalist’s visa or proper government permission. Outside a policlinico, I met Justina, a Havana resident who says she is extremely happy with the health care she’s received. She said she had treatment for everything from ulcers to a heart condition. The inside of the policlinico had a statue of Jose Marti, posters of Che Guevara and the Castros. A handful of patients sat waiting to be seen. According to a clinic staff member, patients walk into the clinics without an appointment, and don’t wait more than a half hour to an hour. Specialists are there every day. One day, a few of us popped into a physical therapy and rehabilitation center in Old Havana. The two exam rooms used laser, electromagnetic and ultrasound technology, but it was hard to tell just how old the machines were. A young patient came in and helped herself to a laser device to treat her knee. People casually trickled in and out of the space, as if they were dropping into an after-school program. Our tour guide, Alejandro, echoed that sentiment. He said Cuban health care has a “human quality.” He says hospitals may lack materials or money for repairs, but there is ample staff time to care for people. 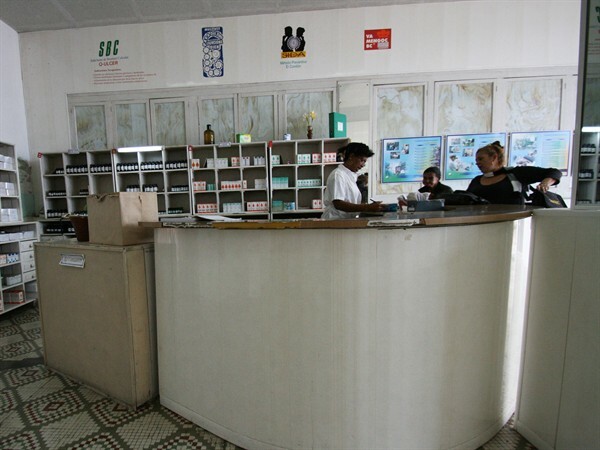 As a group, CapRadio stopped by a pharmacy in the City of Cienfuegos. Our guide told us that Cubans pay for prescriptions, but the pharmaceuticals are highly subsidized by the government. Our tour guide, Alejandro said for a time, he needed an expensive gastrointestinal medication, but the prescription was about a dollar out of his pocket. 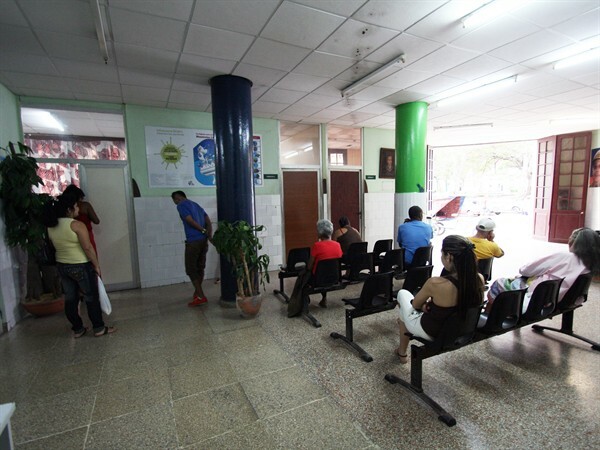 Health care services on the other hand, are free to all Cubans. But the Cuban government wants people to know that these services are free to them, but not to the government. 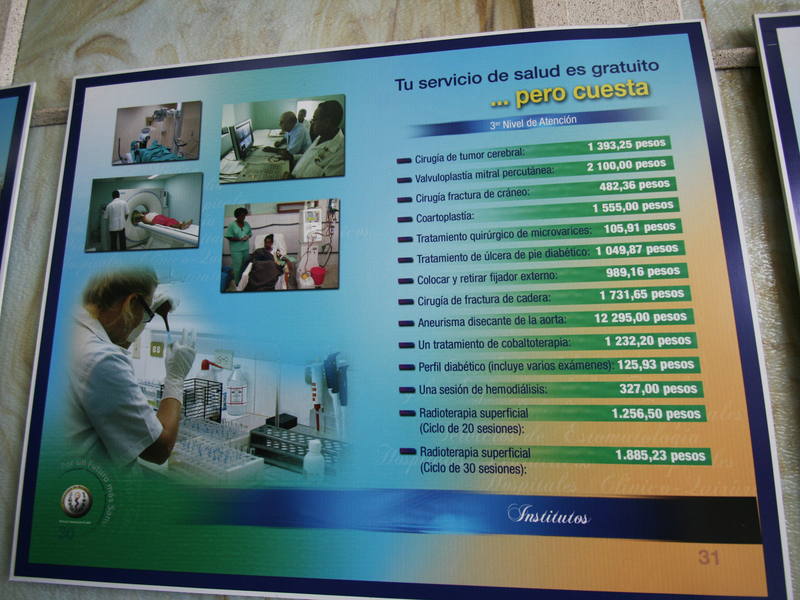 The Cienfuegos pharmacy walls were covered with posters listing health care services and their associated costs. A heart transplant was listed at 163,856 Cuban Pesos, just about $6,183 US dollars. The U.S equivalent to this procedure is hard to determine because of wide variation in hospital pricing, but the federal government suggests heart transplants can cost upwards of a million dollars. Many people on our trip asked our tour guide, “Are things getting ‘better’ in Cuba?” They were referring to the market reforms being implemented since Fidel Castro fell ill, and his brother Raul took power in 2008. Our tour guide Alejandro told us the country has been changing at a slow, but steady pace. Property can now legally be bought and sold in Cuba, and so can new cars (albeit at $250,000 for a new Peugeot). That’s a big change from the post-soviet “special period,” when (as another one of our guides recounts), stores were bare, people made their own clothing, and access to fuel, transportation and electricity was unreliable. If you ask different Cubans if market reforms are improving life for them, I suspect you would get different answers. Although capital may be flowing more freely through Cuba — especially through tourism — the benefits are not shared equally. Doctors and teachers earn a state-fixed salary (national average is about $US17 dollars a month), but tourism workers can make that amount in one day. Our tour guide Alejandro says he makes 50 times what his sister earns working as a dermatologist. Despite salary inequities, many social benefits in Cuba remain intact, affecting Cubans uniformly. Education and health care are still free. People walk the streets without fear of drug violence. Everyone has a small supply of government-supplied food, regardless of their income (although there is talk of changing that soon). Before my second trip, I had wondered if billboards would still be splashing socialist messages all around Havana. The answer is yes. But now, a few billboards also tout the benefits of beach vacations.